T.E.N., a technology and information security executive networking and relationship-marketing firm, announced today the nominees vying for the 2014 Information Security Executive® and Project of the Year Awards for North America. Executives include top-ranking decision makers representing organizations in financial services, commercial, health care, government and academics; projects include large-scale technology endeavors that address key issues in the information security industry. ISE® North America Awards recognize information security executives and project teams who have had a significant impact on an organization’s risk management or information security posture. T.E.N., a technology and information security executive networking and relationship-marketing firm, announced today the nominees vying for the 2014 Information Security Executive® and Project of the Year Awards for North America. Executives include top-ranking decision makers representing organizations in financial services, commercial, health care, government and academics. Projects include large-scale technology endeavors that address key issues in the information security industry. Darrell Jones, Sr. Director of IT Security/Information Security Officer, Herbalife International, Inc.
Mark Graff, Chief Information Security Officer, NASDAQ OMX Group, Inc. The ISE® North America Awards recognize executives and projects, which have made a positive impact on their organizations through risk management, data-asset protection, regulatory compliance, privacy and information security. Nominations are sent to T.E.N.’s distinguished panel of ISE® judges for review and scoring. Della Shea, Chief Privacy and Information Risk Officer, Symcor, Inc.
All nominees will be recognized at the ISE® North America Leadership Summit and Awards on Nov. 5-6, 2014 at the Westin Alexandria in Alexandria, VA. Event attendees can earn up to 9 CPEs for participating in the two-day leadership summit, which will offer dynamic presentations and engaging roundtable discussions — lead by ISE® Alumni — highlighting a spectrum of the industry’s most critical issues and innovative best practices. Finalists and winners are announced at the awards gala that evening and recognized through press coverage and inclusion on the T.E.N. website. T.E.N., a national technology and security executive networking organization, facilitates peer-to-peer relationships between top executives, industry visionaries and solutions providers. Nominated for numerous industry awards, T.E.N.’s executive leadership programs enable information exchange, collaboration and decision-making. Its flagship program, the nationally-acclaimed Information Security Executive® (ISE®) of the Year Program Series and Awards, is North America’s largest leadership recognition and networking program for security professionals. Other offerings include The ISE® Lions’ Den & Jungle Lounge, T.E.N. Custom Programs and the ISE® Industry Expert Advisory Services, empowering IT solutions providers to gain access to highly credentialed IT business veterans’ expertise. For information, visit http://www.ten-inc.com. For more than a decade, the Information Security Executive® (ISE®) of the Year Award Program Series has empowered security executives and their project teams to Connect, Collaborate and Celebrate. Recognized as the industry’s most prestigious IT Security award program, it has become the most anticipated award program for security executives and their project teams. Winners have included executives and project teams from leading organizations such as Nike, The Walt Disney Company, the United States Postal Service, Schlumberger, Texas Instruments, JPMorgan Chase & Co., Equifax, Comcast, PayPal, Northrop Grumman Corporation, and Nationwide. Our distinguished ISE® Judges are past nominees representing a cross section of industries, including commercial, government, health care and academic sectors. For this reason, the ISE® Awards represent the best achievements of the year as evaluated by those regarded as the industry's most influential and successful thought leaders. 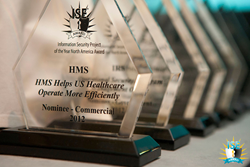 Coupled with a one or two-day executive summit, the ISE® Awards are held across the country and Canada in major cities including Atlanta, Dallas, New York, San Francisco and Washington, D.C. The ISE® Awards Program Series has reached more than 10,000 executives across a broad range of industries and has been a major influence in executives’ careers, knowledge sharing, and the development of peer-to-peer relationships.